Synopsis: Bathsheba is undeniably a minor character in the biblical plotline, appearing in only four chapters in Samuel and Kings combined, and even therein saying and doing very little. Thus she is often ignored or mentioned merely parenthetically. When Bathsheba has been considered, she has been depicted in a myriad of ways on the spectrum from helpless victim to hapless seductress. 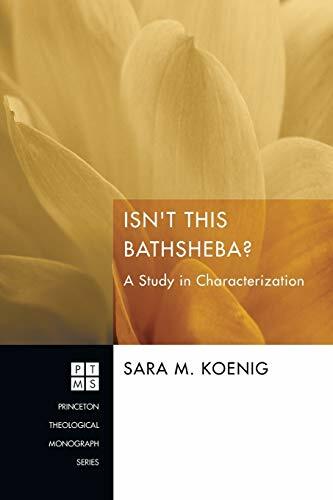 In fact, with so many different interpretations of her throughout the centuries, it is easy to find oneself asking, along with the anonymous informant in 2 Sam 11:3, "Isn't this Bathsheba" This study argues that while she is a minor character, Bathsheba is complex and positive, and shows development from when she first appears in Samuel to when she fades out of the story in Kings. Koenig compares close and careful reading of Bathsheba in the Masoretic Text with the story as it appears in the versions of the Septuagint, the Peshitta, and the Targum of Jonathan. In those versions, Bathsheba's characterization as a complex, generally positive individual and as a character who shows development remains consistent with the Masoretic Text: not in spite of the changes from the Hebrew into Greek, Syriac, and Aramaic, but because of them. This study also considers how Bathsheba is portrayed in early Jewish interpretations from Josephus, the Talmud, and rabbinic Midrash. Even there, the portrayal of Bathsheba is rich and positive. Studying Bathsheba's character has implications for a broader understanding of how texts are read, how meanings are gathered, and how characters are built. About the Author&colon; Sara M. Koenig is Assistant Professor of Biblical Studies at Seattle Pacific University.